Why do we hear more and more about the so-called modern witches? Well, given that women today are faced with a problem of reestablishing femininity within the ongoing cultural changes, more women are searching for a model that is both powerful, independent, perhaps even dangerous, while staying in touch with the beauty they recognize as feminine. And so a modern witch becomes a sort of an aesthetic commonplace which encourages women to explore their identity and sexuality, not through competition, but through communion and sisterhood. So, what kind of aesthetic is at play, or rather, what kind of play is the aesthetics? We are aware of the significance that appearance has in our culture, as we are surrounded by images throughout the day. But that is not necessarily a bad thing. Inhabiting a certain image is not just a passive, but a creative process â€“ in other words â€“ imagination. The image shapes our inner sense of self, and so the witch aesthetics is supposed to inspire and embody a confident self-image. By combining boho and gothic style, this fashion calls for reuniting the bodily, mundane and nurturing of the bohemian with the dark, intuitive and mystical of the gothic. It is also an effort to embrace the traditionally feminine through what has been historically considered an outsider, eccentric culture. The esoteric interest in the meaning and usage of herbs and essential oils is nothing new. However, just as potions, these became a part of the witch pop culture, where women find themselves exploring the beneficial impact these oils have on our mood and overall health. This has become so widespread, that now modern women are learning about these oils, be it for cosmetic and culinary purposes, or just healing the emotional body. And there are plenty of ways you can now delve into this matter, from Youtube to Tumblr, and even entire sites such as madewithoils.com that are dedicated to these topics. Same as the essential oils, gemstones and crystals have become part of the aesthetics, not just for their visual appeal, but for their symbolic significance, as many women try to find the crystal which embodies their desired inner power. DIY is not just a crafty and creative process. From Youtube to Pinterest, we can see the endeavor to create something unique rather than just getting a pre-made mass product. This form of searching for individual expression through arts and crafts has become popular within the witch community. 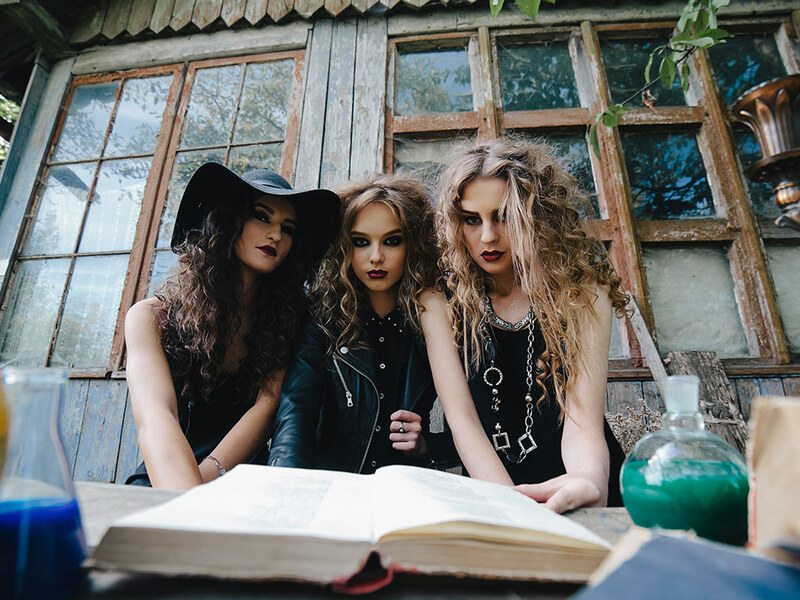 Books of shadows, grimoires, moon phase calendars, jar spells, test tube teas and more, all of these have become a big aesthetic play through which women are experimenting with their darker, mysterious and intuitive selves. Although these have been around for centuries, it is inevitable to recognize the current increase of interest in these topics. One explanation can be the recurring distrust towards the sciences once considered to hold the irrefutable truth. On the other hand, this can also be regarded as part of the aesthetics, as it became an imagery reservoir that helps not only conceptualize, but also deconstruct our elusive identities. If anything, these practices are a clear indicator of the increase in yearning for the spiritual. Most of us have lost the connection between our rational, emotional and physical beings. These simple practices are intended to reconcile our needs and desires, and thus evoke the needed acceptance and desired change. It’s all about the need for reconciliation of the bodily and the spiritual within the modern women. And this is precisely why it has become the concern of the aesthetics since the aesthetic is that which brings together the realm of senses and the realm of thought. The insistence upon healing in these circles shows us where our femininity has been wounded and how inhabiting this image can thus be considered an act of rethinking and acting out the power and beauty of the feminine.